Young children have an insatiable curiosity and an almost limitless capacity to learn. They are natural inquirers, critical thinkers, competent, creative and rich in potential. 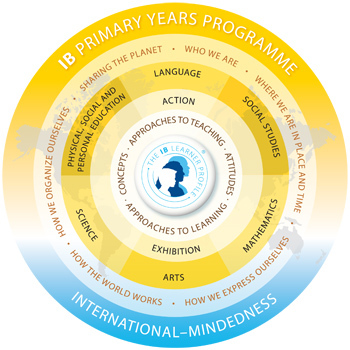 As an International Baccalaureate (IB) World School, our philosophies and teaching and learning programme are developed within the framework of the Primary Years Programme (PYP) framework and with this image of the child in mind. Designed to give our youngest learners the best start on their educational journey, our Early Years programme harnesses children’s innate abilities by providing them with authentic opportunities for solving problems, for creative thinking and for research. We look forward to welcoming your child to the Early Years! As a school committed to the IB Primary Years Programme curriculum, we recognise inquiry as a powerful pedagogical approach. Our curriculum is balanced, concept-based and planned around our learners. In the Early Years the negotiated curriculum provides a means to recognise and support students’ interests and passions within the framework provided by the PYP Units of Inquiry. This motivates children as their questions drive in-depth investigations and encourages their enthusiasm for learning. We recognise, value and draw on the funds of knowledge that children have already gathered from home and family, from peers, from popular culture and from their experience of the world. Our Early Years educators recognise and value play as a primary tool for making meaning and therefore for learning. Free choice time scheduled in long periods enhances the complexity of play and teachers observe, ask probing questions that challenge children to comprehend at deeper levels, and encourage sustained, shared thinking. Research also informs us that children make better all round progress in settings where there is a balance between adult-supported freely chosen play and adult-led small group activities and our teachers are mindful of this balance in their daily planning. Children are encouraged to express their understandings and theories through many symbolic languages which may include drawing, mathematics, writing, music -making, singing, movement sculpture, painting, dramatic play, and the use of technology. A flexible, resource rich learning environment is an essential element of our programme and our learning environments, both indoors and outdoors, create a variety of opportunities for social interaction and learning. Learn more about our programme in our publication "The Early Years Vision in Action". Our Early Years Educators are highly qualified and experienced international teachers with specialist knowledge that informs how they plan learning for the particular needs of young children. Our teachers place a high value on multilingualism alongside inter-cultural understanding and this is embedded into our school culture. Teaching and learning at ISZL is evidence-based and our teachers are committed to keeping up to date with current research with the aim of discussing and creating shared understandings alongside a critical view of practice and a focus on professional development. Our Early Years teaching teams benefit from the inclusion of assistant teachers in all classes, specialist teachers for Music, Physical Education and English as an Additional Language, along with an Educational Technology coach. In the Early Years we aim to develop strong relationships with the children and develop their sense of belonging. Children’s perspectives are listened to and respected by all as we aim to create a learning environment where each child is listened to and their needs are addressed and where problems are solved collaboratively. We trust and support children to exercise self-direction and self-regulation, using strategies to help children to reflect on their actions, to verbalise their emotions and to express their feelings and views. Our teachers are intentional in supporting children to respect one another and are aware of cultural backgrounds and languages represented in the group and make the school culture inclusive of all students. All children experience transitions as part of the programme, and as part of their individual development. Small, routine transitions mark each day, from arriving to sitting down for meals and then leaving for home and our teachers spend time establishing classroom routines and developing a positive, constructive learning culture. Children are supported with ‘keeping track of time’ by providing an overview of the daily schedule and are given time to transition from one activity to another. Our teachers understand the importance of knowing children, their families and their communities, and building strong, positive partnerships that support bigger transitions. We are sensitive towards those children who experience change as a result of the move of a friend and they recognise these children may need additional support. We also recognise that children transitioning into our school are experiencing extensive changes in their lives. We are sensitive to how these children settle into their new environment and provide additional time and support when needed. At ISZL we aim to support student diversity and we recognise that students learn different ways. We understand the need for personalised learning to meet the needs of all learners therefore Student Services offers a comprehensive learning support team who plan differentiated learning for students. EAL (English as an Additional Language) teachers, school counsellors and school nurses work collaboratively with the each student’s teachers to support their individual academic, social/emotional, physical and health needs. We have well established links with specialist support services in the area including educational psychologists and behavioural therapists. A private speech therapist is available on campus, should parents engage this service. We foster an appreciation of diversity and international mindedness through our units of inquiry, through the diversity provided by our own international community and by creating links to the local Swiss community through German language and culture. Children in Kindergarten have four German lessons per week as a class with a German teacher and assistant teacher. We recognise the importance of L1 language development and, when possible, provide opportunities for children to use their language of choice. We also recognise that the language of instruction plays a key role in learning and, in promoting equality in children’s opportunities to learn, we strive to support the additional needs of EAL students. In Kindergarten children for whom English is an Additional Language, are supported by a specialist teacher who works closely with classroom teachers. In the Early Years students use technology as a tool to further their learning. They are supported in this by their classroom teachers, assistants and a Technology Coach. From Early Years 1 to Grade Two students use SeeSaw as a platform for documenting their learning in a portfolio format. Teachers post regular communication for parents via Schoology, our virtual learning environment. At ISZL we believe that spending time outdoors is good for children’s health and well-being and that direct experience of the natural world can motivate positive environmental action especially when supported by adults. Outdoor Learning sessions and forest visits provide the children with opportunities to move about freely and be physically active, as well as offering challenge and risk within a framework of security and safety. In the Early Years at ISZL the children have two extended opportunities for learning outdoors each day. In our outdoor environment the children have access to a range of open-ended materials and resources. Planned learning engagements also provide opportunities for physically active learning and the development of fine and gross motor skills. Once every 3 weeks each Early Years class has a planned morning in the forest with a forest leader supported by the class teacher, assistant teacher, and one or two parent volunteers. We also recognise the value of first-hand experiences for learning and we aim to take advantage of the many opportunities available on our doorstep such as farm visits, museum visits and trips to local landmarks such as the clocktower in Zug and the bridges in Luzern. ISZL's library provides resources for the children to indulge their curiosity as well as build their knowledge and confidence in finding and processing information. School libraries play a key role in supporting and developing enjoyment of reading and multiple literacies. Students have access to the library and librarian whenever appropriate for information literacy sessions that support their learning. A Teacher Librarian comes to the classrooms and provides in-class literacy support when appropriate. Early Years students visit our library each week to exchange and borrow books with their class. There is a special section in the Junior Library for Early Years students to browse and borrow from. We also encourage parents to bring their children at any time to enjoy the collection. The Teacher Librarian works as a literacy specialist during Outdoor Learning, bringing all elements of literacy to our outdoor environment. During Outdoor Learning time, the Literacy Specialist picks up on conversations and questions that the students may be having and provides resources to extend their developing literacy. Learning spaces at ISZL make visible the essential elements of the Primary Years Programme framework: skills, attitudes, concepts, knowledge and action. Flexible and open-ended educational resources are chosen both indoors and outdoors in order to activate a process of research, reflection, creative thinking and the development of working theories. Children are able to access materials as and when they need them, which encourages independence and a sense of ownership as well as promotes children’s agency. In Early Years 1 and 2, students can attend school either mornings only or the full school day. Kindergarten students attend for the full school day. Regular school hours are 8.50 to 15.30. The school day begins as the children start arriving from 8.30. Classes start at 8.50. In Kindergarten the teachers and assistants welcome the children to the Outdoor Learning environment, which includes the mud kitchen, the sand pit, the climbing tree, the pond area and the fire pit. All children in the Early Years have the opportunity to explore and learn here twice a day, taking advantage of whatever the weather brings - sunshine, showers and sometimes snow! Every Thursday and Friday one of our classes spends the whole morning at the local forest, exploring this wonderful, natural environment. Back in the classrooms the day begins with a morning meeting when teachers and children plan their day together, with learning engagements framed around the units of inquiry. In Early Years 1 the children choose which room they would like to explore: the Art Studio, The Construction Room or the Role Play room; or there is always some cooking or baking to help with. Each morning at about 10.00 there is time for a snack together and then maybe time for singing or to visit the library before their first Outdoor Learning session. In Kindergarten the morning’s activities might include Writers’ or Readers’ Workshops, German or a swimming lesson at the local pool. At 12.00 everyone takes a break for lunch. Our youngest children in Early Years1 and 2 eat lunch together in their classroom and then rest or nap if they need to. They have time together as a class before they head off for their second session of Outdoor Learning. Kindergarteners enjoy their time together eating lunch, before going outside to play. They come in refreshed and ready for the afternoon when they might try a Maths investigation, have a Physical Education lesson or maybe visit the Library to choose a book to take home. At 15.25 the day is finished and everybody packs up ready to meet parents outside or head to the school bus to be taken safely home.